BEYOND offers complimentary consultations for Botox, Juvederm, Voluma, Restylane, Dysport, Radiesse, Xeomin, Belotero, Kybella & Microneedling with Laurie Tare, Physician Assistant at Hackensack Meridian Health. Join our Loyalty Program and receive great rewards. For information and scheduling, please call 551-996-4500. The Dermapen 3 is a micro-needling device which offers collagen induction by harnessing the body’s innate ability to re-grow and repair the skin in response to micro-damage. The Dermapen delivers up to 1,300 micro punctures per second into the skin, stimulating collagen and elastin production and normalizing various skin functions. Because the process activated by micro-needling generates healthy skin cells to replace aged or damaged ones, applications for the Dermapen are very diverse. The device has been used to treat visible signs of aging, such as skin atrophy and wrinkles, as well as acne scars, stretch marks, pigmentation disorders, sun damage and more. Typically, you will see results after the first treatment. Lasting and more significant results will occur after 4 to 6 treatments (spaced 4-6 weeks apart). Your skin will continue to improve over the next 6-12 months after a course of treatments. For minimum needle depths, Dermapen treatments are painless. There is generally no downtime needed after the treatments, but you may experience facial redness for 12-48 hours after treatment. Most people are able to return to normal daily activities immediately. 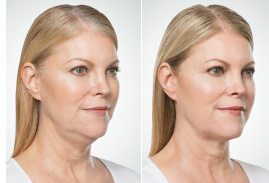 Kybella may be right for you if any of these are true: you’re bothered by fat under the chin, also known as submental fullness, you feel the condition makes you look older or heavier than you actually are, you don’t want to have surgery, you eat well and exercise, but submental fullness does not go away.